Tammy's students used construction paper (fade resistant Tru-Ray is recommended). 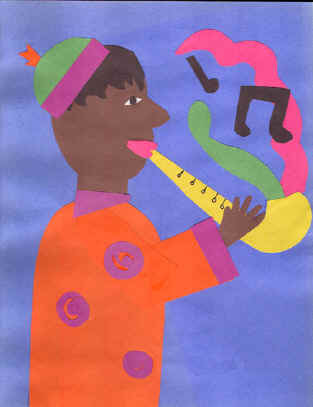 Students listened to Jazz music and talked about the life and art of Romare Bearden. You could show a PowerPoint of Jazz musicians and give students pictures of instruments. Student created these colorful collage from cut construction paper and only used black marker for some final details at the end. 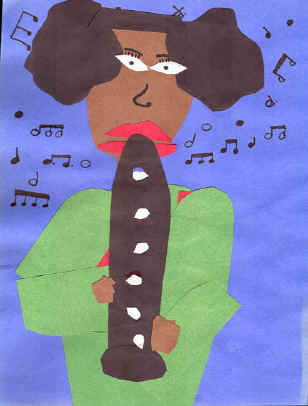 You could do these as self portraits, too - What instrument would you play? The new CD - Romare Bearden Revealed would be a good choice for this lesson - along with the Shorewood print Carolina Shout. 2. Distinguish commonalities, characteristics of artistic styles of expression - compare work of Romare Bearden and Jacob Lawrence. 2. Introduce the concept of visual symbols by eliciting examples from students, such as a red cross, skull and crossed bones, automobile symbols, sports team symbols, or others with which they are familiar. 3. Introduce the idea that artists often use visual symbols in their work, and Romare Bearden was such an artist. Ask students to look for symbols in Bearden's works and speculate about meanings. Ask students to give reasons for their interpretations. Focus on the train symbol in several of Bearden's works and help students relate it to their studies of the Black migration from the rural South to urban centers in the North. Focus on Bearden’s representation of "sound" in his works. 2. Drawings – Musical instruments.